We got a lot of snow yesterday - our biggest snowfall this season. My attitude towards the snow appears to be a bit of an anomaly, as I enjoy being outside in the fluffy white stuff. Even the shovelling is not a dreaded chore as these scoops are used as much for play as for work. With the help of a willing partner, they are transformed into a PTS ("personal transport sleigh"). Sitting in the scoop with your legs folded in, you can travel easily and quickly over tops of snowbanks, rickshaw style. 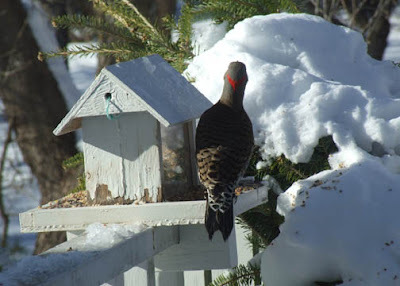 The feeders were all empty this morning as the snow brought out many hungry birds, including one absolutely huge woodpecker whom we hadn't met before. We are still hopeful the cardinals will make an appearance before long. Today will be a cosy inside one, sewing on Farrago while watching a movie. I am also working away at a small project for Valentine's which I will post as a tutorial in the next few days. Keep checking back. 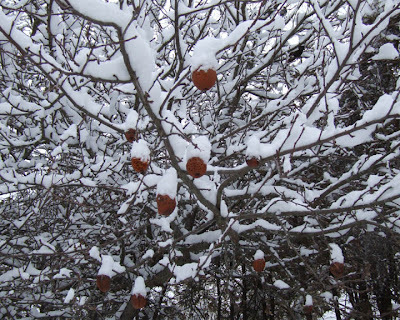 and the apples left hanging on the tree last fall look as though they have a dollop of frosting on top. 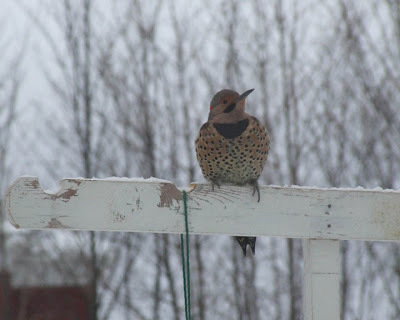 Snow always brings birds out to the feeders and yesterday the Northern Flicker enjoyed a long visit. He sat very still and surveyed the yard for quite some time before beginning his feast. ...before being invited to enjoy the main course with an accommodating Blue Jay. You can see the size difference between the two in this picture. Hey, where did that Blue Jay go? No manners for that fellow! Inside, I knitted on the socks while watching his antics through the kitchen window. The muslin socks are coming right along; one is on the straight part of the foot, and the other has the ribbing cast on for the leg. I also poked away at finishing up the foundation blocks for another Farrago. It's a nice change to sew without a deadline. 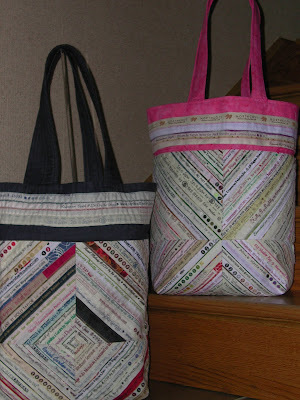 Here's a couple of Selvedge Tote Bags made by Barbara Ataman from Ontario. The denim bag is hers and the pink one her daughter's. I'd say she's been saving selvedges for quite some time. Thanks for sharing, Barbara! So many of you have asked for the pattern for this tote, so here it is! The instructions are now available on the checkout of the "Pattern" page of my website. 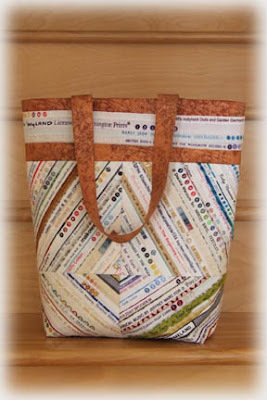 Pattern includes directions to also make a smaller "Gadget" Bag, sized to hold a cell phone, iPod or a digital camera. The bag may be clipped on your belt loop (with a carabiner) or worn around the neck. The neck strap tucks neatly inside when not in use. My checkout is through PayPal, but you do not have to have a PayPal account to use this feature; Visa and Mastercard are also accepted. You can also download the pattern in PDF format from Craftsy. These are both super fun projects which generate a lot of comments. Someone ALWAYS stops to ask! After spending the morning wrestling with wording instructions and tweaking a new design for some Robin Pandolph fabrics which have caught my eye (! ), I needed some soothing sewing for this afternoon. I raided the box of "sea" fabrics and used pre-printed foundations. This is the centre of Farrago, pieced in aquamarine, celadon, peacock, teal, cyan, turquoise, seafoam, ocean, lagoon, algae, Caribbean, cerulean...and a myriad more colour names that make my hubby say "call it green or blue." The background under the spikes is actually light silver, although it looks white in this shot. There is no deadline on this project, it will be used as a store sample for shops to display with the patterns. It's always nice to have things sewn in several different colourways. This is the start: And here's the finish, from last evening...ahhhhh... wool socks are so soft and cosy. We all know that one: practice, practice, practice...Like most everyone else, practising is not one of my favourite things. A quick warm-up and I'm impatient to tackle the real thing...for better or for worse (often the latter!) This afternoon I decided I would practice quilting on the new machine. Certainly I am not new to machine quilting having been working at this for over 20 years. However, each machine is different and it's important to get the feel for how the machine responds. A quilter and her machine become one; a zen thing. I quilted curves first one way then in the opposite direction, much as you would quilt plain patchwork squares. Mind you, these squares were not quite 1/2" so it was a little tricky to keep the arcs smooth. It looks like this on the back; this is a polyester batt. Then I moved on to feathers, which I am interested in doing free hand. The straight ones were fine, but this wreath gave me trouble. I did mark the circle with pencil first. This is done using a cotton batt; it has much less loft than the polyester. I did several more freehand; I think the feathers look best with a line of echo quilting stitched around the outside. Down in the bottom right of this picture is a motif traced from a set of acrylic French Curves purchased last year in an art supply store. There are four different curves in the package, of varying sizes, and they make great quilting designs. It's a bit hard to see this on the ecru, but the big curly feather in the centre is discernible. Oh my...no guessing why these activities are termed "challenge". This is an annual fund raising (sometimes hair-raising!) event through the Canadian Quilter's Association, of which I am a member. Trend Tex Fabrics donates the prints and a new theme is determined each year. This year it's "The Sky's The Limit". Each participant receives 5 Fat Quarters to create their masterpiece. The fabrics this year are Dreams by RJR Fabrics, Flights of Fancy by Michael Miller, Bali Handpaints by Hoffman, Quilter's Basics by Stof, and Willow by McKenna Ryan. This will be 10 years or so that I have been participating in this challenge, and it's always an enjoyable stretch to work with fabrics I would not necessarily have put together on my own. There are two projects yet in my workroom needing finishing before I can start, but I will work away on this in my head. Deadline for the completed pieces is March. Quilt Canada, the national conference of the Canadian Quilter's Association, is being held this year in Calgary. More information on the event may be found on the CQA website. A short newsletter went out this morning to all subscribers. If you would like your name added to the list to receive these mailings, kindly send a note and we'll add you to the list! The year is off to a good start, including getting that wretched Christmas tree out of the house. I was not a bit sorry to see it leave. Sadly, the tree never quite recovered from the tumble it took, and I think Santa was generous in his gift giving out of pity when he saw that tree... 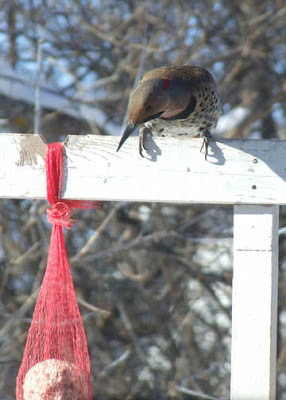 It has now been put to a much better use, as hubby has installed it outside on the deck near the bird feeders. We have done this for 20 years or so, after discovering that the birds enjoy it so much. The small ones hide in its branches, and the traffic to the feeders increases significantly after the tree goes up. 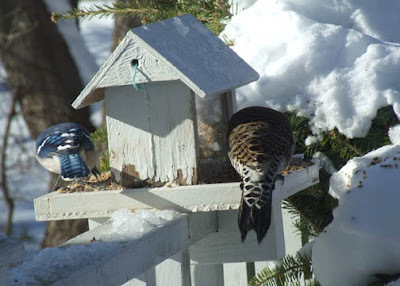 Already the Northern Flicker (above) has become a regular visitor. There were some "quilty" gifts to be found under that Christmas tree, including this lovely pendant made by Patternworks, in Chester, Nova Scotia. Another interesting thing I received is this Bird's Eye Maple letter opener, which has been drafted into service in my sewing room. It will make a dandy point turner. Bird's Eye Maple is my favourite wood. Progress on the socks has been unusually good (an indicator of how much hockey I am watching...) The stitches are ready to be picked up along the side of the heel on the second flax one. I am guessing not much knitting will get done this evening, as Canada is playing the U.S. for the Gold Cup in the IHF World Juniors and I will be paying close attention. 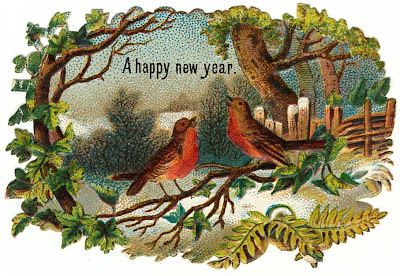 A new day, a new year, a new decade...wishing you and yours opportunity to stretch your creative wings. Happy 2010.